It’s time for another Blogger’s Choice recipe swap! As much as I like being assigned ingredients or a specific dish, I think I like the Blogger’s choice version just as much because then I have free reign to choose what I’d like to make based off what I have in the fridge, what Tom tells me he wants me to make, etc. I immediately knew I wanted to do something with beef since we had a bunch of it in the freezer. 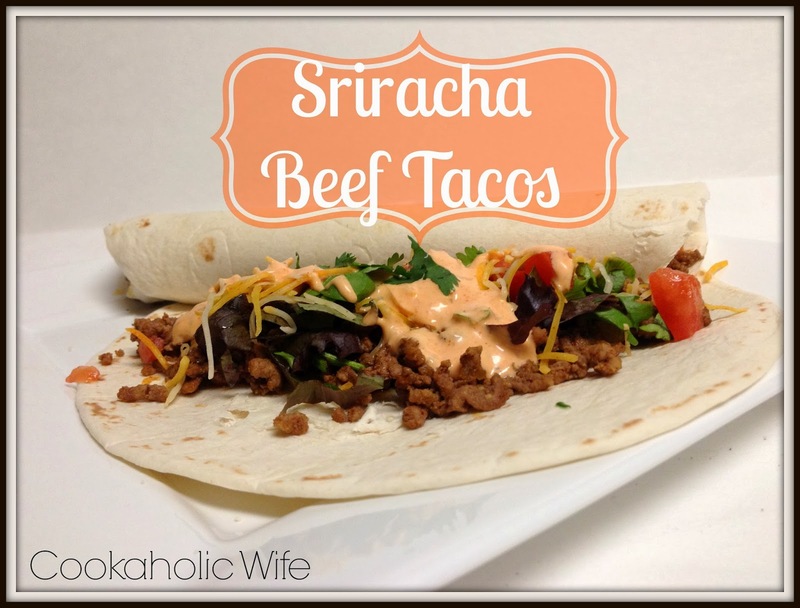 I had a hard time narrowing it down between a few recipes but then I saw this recipe for the Sriracha Beef Tacos and I knew I absolutely had to make them. We are a Sriracha loving household and I am sad to say it has been quite some time since I’ve actually made a recipe using it. If I ever ask Tom what he wants for dinner, his standard response is tacos so I figured this was probably the best thing I could ever make. Toppings: shredded lettuce, diced tomato, shredded cheese, salsa, sour cream, cilantro, etc. 1. Combine the ranch dressing and 2 tablespoons of Sriracha sauce together in a small bowl. Set aside. 2. Heat the olive oil over medium heat in a large skillet. Add the onion and garlic and cook for 3-5 minutes or until softened. Add the ground beef/sirloin to the skillet and cook until browned. Drain any grease. 3. Add the water, chili powder, cumin and remaining 2 tablespoons of Sriracha. Stir to coat the meat, reduce the heat to low and allow to simmer for 5 minutes. 4. Warm the taco shells (if necessary) and assemble with your desired toppings. Divide the taco meat between the shells. A Sriracha ranch mixture will definitely make an appearance on my tacos in the future. Tom wasn’t interest in trying it because he prefers taco sauce and only taco sauce, but all I can say to that is more of it for me! These are such a great twist on the traditional taco.